Destructive earthquakes and tsunamis have ravaged the Eastern Mediterranean Basin, the Greek mainland and the islands of the Aegean and Ionian Seas. Large destructive earthquakes and tsunamis resulted in extensive destruction of the Minoan and early Greek settlements (Pararas-Carayannis, 1973). The following is a brief overview of major historical tsunamis in Greece and the potential for tsunami generation from large earthquakes in the region. The Palaces of the Minoan Empire at Knossos, Crete, were destroyed by large earthquakes in the 1700's B.C., were rebuilt but damaged again by subsequent earthquakes and tsunamis associated with the explosion/collapse of the Santorin volcano in 1490 B.C. Geological Instability of the Eastern Mediterranean Basin and Potential for Large Tsunamigenic Earthquakes in the Aegean and Ionian Seas. 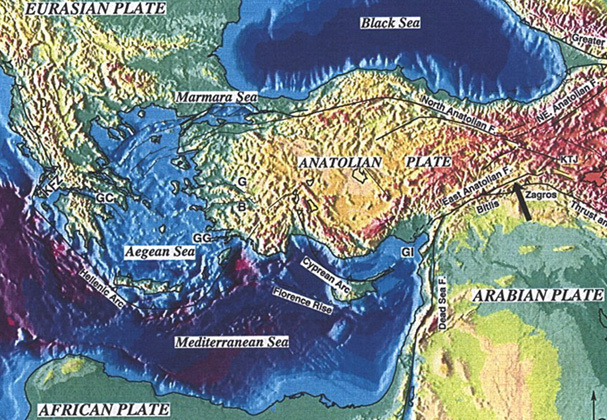 The eastern Mediterranean basin where the Anatolian plate extends, is one of the world's most intense seismic zones where large destructive earthquakes occur with frequency. The geological instability and the resulting earthquakes are caused by the active grinding of the Anatolian plate wedged against the continental plates of Africa, Eurasia and Arabia. As these larger tectonic plates grind against the Anatolian plate, Asia Minor and Greece move, smashing closer together in some places and drawing apart in other regions. The 500-mile North Anatolian fault marks the northern boundary of the Anatolian plate grinding against the Eurasian plate. This great fault zone appears to be moving eastward at the present time. At its western end it impacts on the North Aegean fault, a volcano-dotted undersea rift that runs down the middle of the Aegean Sea. The fault zone then meanders under Greece and heads up the Ionian and Adriatic Seas. As a result of active interaction and movement along these major faults, hundreds of earthquakes of all sizes are recorded every year throughout this region. Since 1964, more than 20,000 quakes have been recorded around Greece alone. Historical Tsunamis In Greece - The Potential for Tsunami Generation in the Aegean and Ionian Seas. Of a total of 613 known historic earthquakes, at least 41 major events generated documented tsunamis that struck coastal areas of the Greek mainland and the Aegean islands. 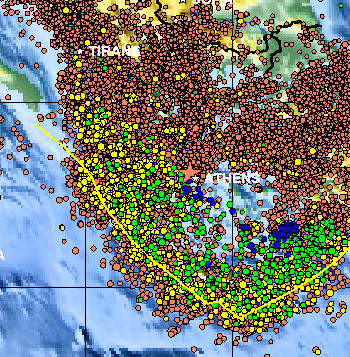 Sixteen of these earthquakes resulted in really damaging or disastrous tsunamis. Between 1801 and 1958, 482 earthquakes with intensity equal or greater than VI, and 170 with intensity greater than VIII occurred. Twenty of these earthquakes resulted in tsunamis and six of these tsunamis were particularly damaging or disastrous in the Aegean and the Eastern Mediterranean Sea (Galanopoulos, 1960). Thus, the occurrence of large tsunamis is quite usual for the Eastern Mediterranean and the Aegean Sea. Most of the large historical earthquakes are associated with the seismic zone of the convex side of the Hellenic arc (Hellenic Trench) (Papazachos et al., 1985, 1986). Extension and normal faulting within the Aegean plate are consistent with a NE-SW trending graben along which the Santorin volcanic field has developed. Most of the larger destructive tsunamis in Greece have originated from this region of the Hellenic arc, near the island of Santorin (see map). There is substantial historical evidence that large earthquakes near the island of Crete were responsible for the destruction of the Minoan palaces of the island, including Knossos. The first major destruction of the Palace of Knossos by earthquakes occurred around 1720 BC. After the palace was rebuilt and restored to its original splendor, it was again destroyed by the earthquakes of the fourteenth century BC (Pararas-Carayannis, 1974). Tsunamis were responsible for subsequent destruction. A number of catastrophic sea waves were generated from these early earthquakes and from the gradual collapse of the Santorin volcano over a period of time. The final explosion and collapse of the volcano of Santorin in 1490 B.C. generated a much larger tsunami, or a series of tsunamis, that inundated the coastal towns of Crete and acted as the catalyst in the declination of the Minoan civilization (Pararas-Carayannis, 1973). There is conclusive evidence that Minoan cities on the north and east coast of the island of Crete were also struck by huge tsunami waves (Marinatos, 1939). These included Amnisos, Malia, Niron Chani, Psira, Ghoumia, and Zakros. Nothing is definitely known about the height of the Bronze Age tsunami on other Aegean Islands but estimates were made based on field collected data. A rough estimate of the Santorin tsunami at Anaphi island, the closest to the origin, was extrapolated from the 7 m tsunami (corrected for eustatic change), as documented at Jaffa-Tel Aviv, 900 km away (Pararas-Carayannis, 1992 ). This estimate, based upon geometrical dispersion, neglecting effects of refraction, diffraction, or resonance, results in a height of 42 m, consistent with the 40-50 m elevation at which pumice deposits were found by Marinos and Melidonis (1959). The highest possible tsunami wave at the source could not have exceeded 50 m (Pararas-Carayannis 1992 ). Following the eruption and collapse of the volcano of Santorin many more tsunamis occurred in the Aegean Sea. For example, in AD 365, a destructive tsunami struck the Island of Crete and was reported as far as Alexandria, where ships were carried inland and left in the streets of the city. On 26 September 1650, a destructive earthquake was accompanied by a submarine explosion from the Colombo Volcano, whose crater lies in the sea on the northeast of the island of Santorin. There was a devastating tsunami observed on the island of Ios, north of Santorin, and waves of up to 16 m were reported. In 1672, the islands of the Cyclades, and particularly Santorin, were again shaken by an earthquake. The island of Kos, to the east, was reported to have been swallowed up presumably by the resulting tsunami. The best documented and most recent tsunamigenic earthquake in the Aegean Sea is the one that occurred on 9 July 1956 near the southwest coast of the island of Amorgos, killing 53 people, injuring 100, and destroying hundreds of houses (Galanopoulos, 1957). The waves were particularly high on the south coast of Amorgos and on the north coast of the island of Astypalaea. At these two places the reported heights of the tsunami were 25 and 20 m, respectively (Galanopoulos, 1960). These are only a few examples of tsunamis in Greece. There have been many more events in the Aegean and Ionian Seas as well as in the Gulf of Corinth. Pararas-Carayannis, G., 1973, The waves that destroyed the Minoan empire, Sea Frontiers 19(2), 94-106. Pararas-Carayannis, G., 1974, The waves that destroyed the Minoan empire, Revised for Grolier Encyclopedia, Science Supplement, Man and His World, pp. 314-321.